To weave the ball in two different ways with the different techniques of weaving. Composite balls designed for any occasions. They can decorate your home interior or to use at their discretion. Very nice such a ball ofs if they are painted in Golden and silver color. Then patience also is necessary because equipment to develop the first time is difficult. You should start with the most simple. Balloon, string, strong, PVA glue, acrylic paint in spray gun, willow branches (flexible), 4 branches 15 cm - frame, 3 branches, 50 cm - for weaving. Find a place to work. Decide which option you want and prepare the necessary materials. Best to start with light weaving, the next stage will be easier to learn through this. Take a round air ballIR, lubricate with white glue and ordinary thread spool in different directions. Wrap up until the "empty" space is filled, then leave to dry for a day. Finished dry cocoon and pierce with a needle and pull out the remnants of the balloon. Can ready paint the ball with acrylic paints. Weaving willow requires patience and care. Willow branches before work it is necessary to clean and one hour to keep warm water. From this, they become more flexible. First you need to select 4 branches 15 cm Connect the ends of the thread - you will get 4 laps. Then insert them into each other, and fastened together with a thread. Thus, you should get form ball. Take a long branch and gently start twisting this balloon so that the ends of it is "hidden" inside the Orband was on the surface. Need to spin up until the ball does not become dense, and large holes don't turn into little. If the ball was not sufficiently full, repeat the weave. The ends of the branches try to hide inside the ball. Two days later, the ball dries and you can paint. Carefully follow the work - willow branch can bend if you push hard, so don't use thick branches to thin. Be careful about the thickness. 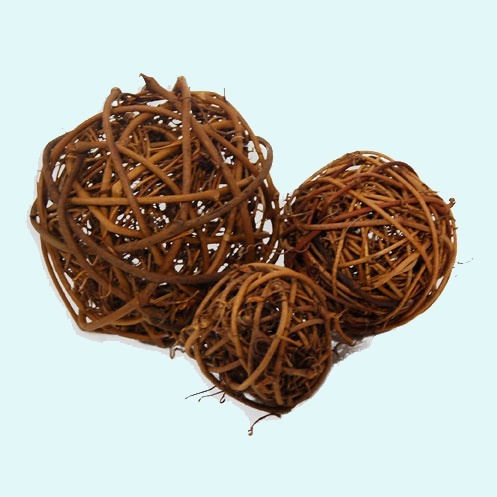 At the request of the willow branches, you can make balls of different sizes. For the 4 main branches should be longer. Paint can only dry balls.